The 2016 Summer Olympics takes place during the month of August in Rio de Janeiro. Apart from the focus on the athletes’ performance, the world is particularly concerned with the impacts on the spread of the Zika virus. Although August is not a mosquito season in Rio, numerous precautionary measures are taken by the Brazil government to prevent transmission of the virus among athletes and tourists. 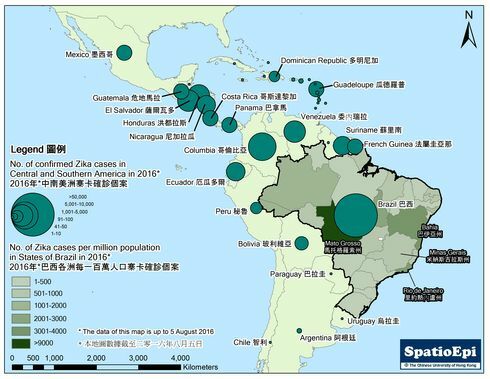 The map shows the updated epidemic status of Zika in 2016 on the eve of Rio Olympics (5 August), highlighting the situations in countries of Central and South America and at state-level in Brazil. Cumulatively Brazil has reported 66,180 confirmed cases. Columbia and several countries of Central America also have more than 3,000 cases identified. Within Brazil, Bahia and Rio de Janeiro are the most seriously affected places in term of the cumulative number reported. Both have identified more than 40,000 suspected and confirmed cases. Expressing as an incidence by population, Mato Grosso gave the highest rate of around 9,000 cases per million population. The impacts of the Olympics on the Zika epidemic, if any, would unfold in the months to come. Data for this map were obtained from FluTrackers and Health Ministry of the respective countries.